The Municipal Chief Executive (MCE) of the Ayawaso East Municipal Assembly, Hon. Hajia Salma Mohammed Sani Adams Kuta, has revealed that one of their main projects in 2019 is to establish a community Senior High School for the people of Nima. 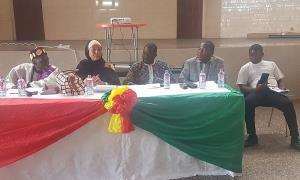 She said these in an interview with ModernGhana during a public forum held by the assembly on Thursday 28th, March, at Nima, where she outlined the Assembly's plans and projects for the year 2019. According to her, having a Senior High School at Nima would reduce the pressure on the community and other schools around Nima and its surrounding communities. "Nima as Munich don't have a Senior High School and it has been one of the challenges on our tables so we want to address that issue so our children can have access to quality education since it would reduce pressure on other schools around," she said. On tackling sanitation, she said, Nima has improved a bit on the issue of sanitation, hence the assembly would keep on doing its best to educate and sensitize the residents to ensure Nima becomes one of the cleanest assemblies in the capital. She added that the assembly is also working with the Nima Divisional Police to maintain law and order and further consolidate the peace and stability in the area. The forum held was based on section 82 of the local government Act, 2016, Act 936 established planning authority for each metropolitan, municipal and district assembly to perform planning functions to facilitate comprehensive development.